FAYETTEVILLE, Ark.- The No. 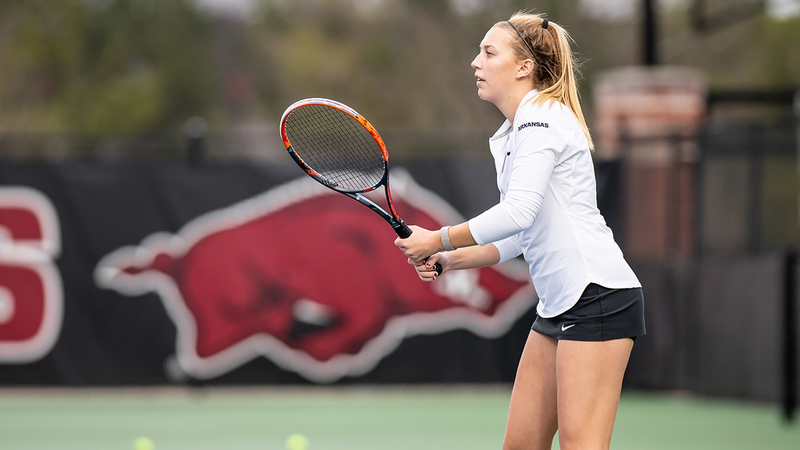 45 Arkansas women’s tennis team will open play at the SEC Tournament Wednesday morning as the No. 11 seed, facing the No. 14 seed Missouri. The Hogs are coming off a 2-1 road weekend, falling to Alabama before defeating Auburn and Chattanooga. Arkansas swept the Tigers and the Mocs after dropping a close 4-2 match to the Tide. Two Razorbacks remain in the ITA rankings after the conclusion of regular season play, with sophomores Martina Zerulo and Tatum Rice both moving up. No. 76 Tatum Rice jumped 10 spots, going 3-0 at the No. 2 position last weekend. No. 85 Zerulo moved up three spots and now sits in second place on the team in singles wins with 12, just three behind Rice’s team-leading 15. The team is gaining momentum in doubles play, winning the doubles point in the last four matches. Tatum Rice and Lauren Alter have gone 3-0 at the No. 1 position in the last four matches, with Zerulo and Thea Rice going 3-1 at the No. 2 position. Arkansas made an impressive run at last year’s SEC Tournament, winning three matches at the tournament for the first time in program history and advancing to the semifinals. This will be the second year in a row that the Hogs will open the tournament against Missouri. The Tigers are 14-14 (0-13 SEC) entering the tournament, falling to the Razorbacks earlier this season. This will be the 13th time the two programs will meet, with Arkansas holding a 9-3 series advantage. First serve at the Mitchell Tennis Center in College Station, Texas, is set for 10 a.m. Wednesday afternoon.